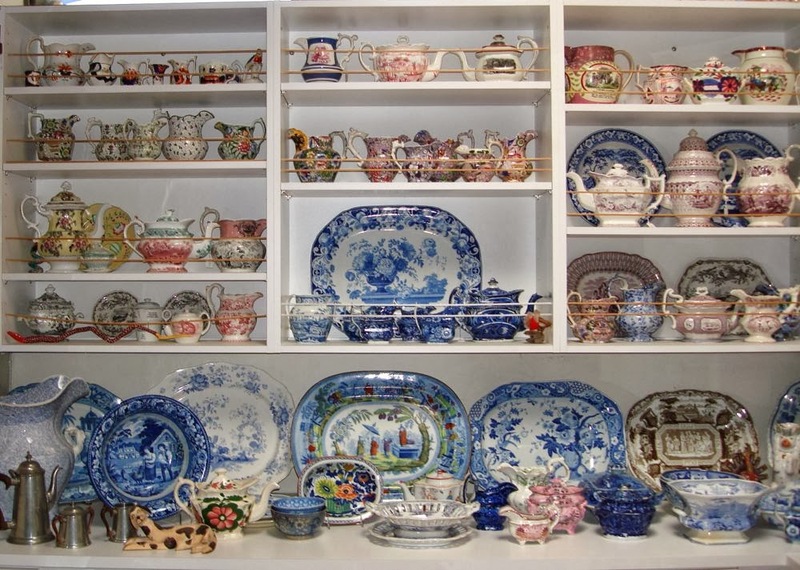 The Ladies Of Llangollen pattern, ca. 1825. Both the Glamorgan Pottery and the Cambrian Pottery made this pattern. 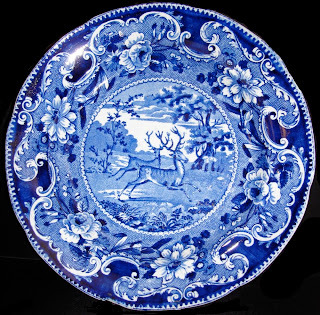 Years ago I found a plate with spider webs in the border (they are probably stylized flowers). 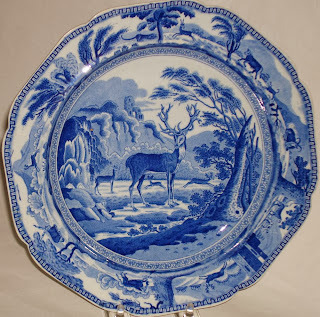 I loved the border and liked the center pattern, but hadn't a clue as to its history. 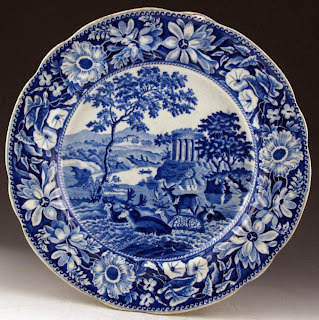 I discovered that the pattern is known as The Ladies Of Llangollen (pronounced a bit like hahlnglathlan). I know I am hopelessly mispronouncing the name. 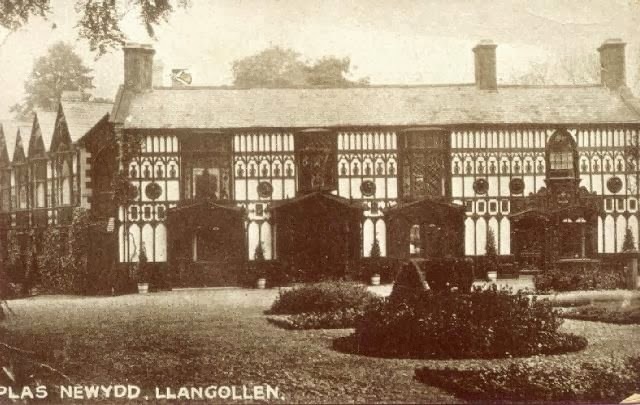 I read that the ladies, Eleanor Charlotte Butler (1739-1829) and Sarah Ponsonby (1755-1831), eloped at the end of the 18th century to Llangollen in Wales, where they lived in an elaborate cottage, Plas Newydd (New Place), for more than 50 years. It was a great scandal. 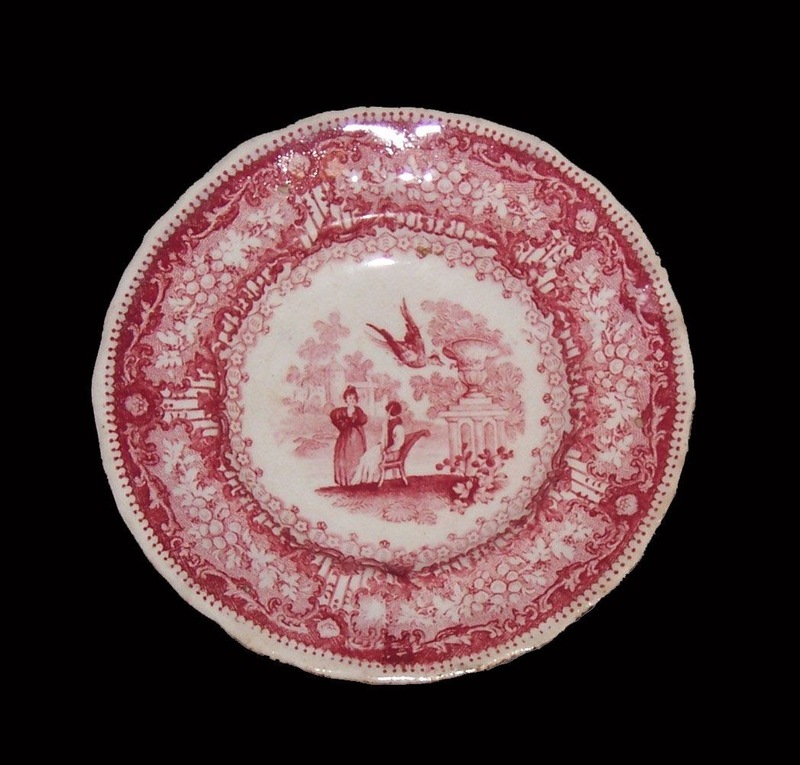 The ladies were aristocrats whose main purpose was to wed, to mother, and to join with another aristocratic family and estate. 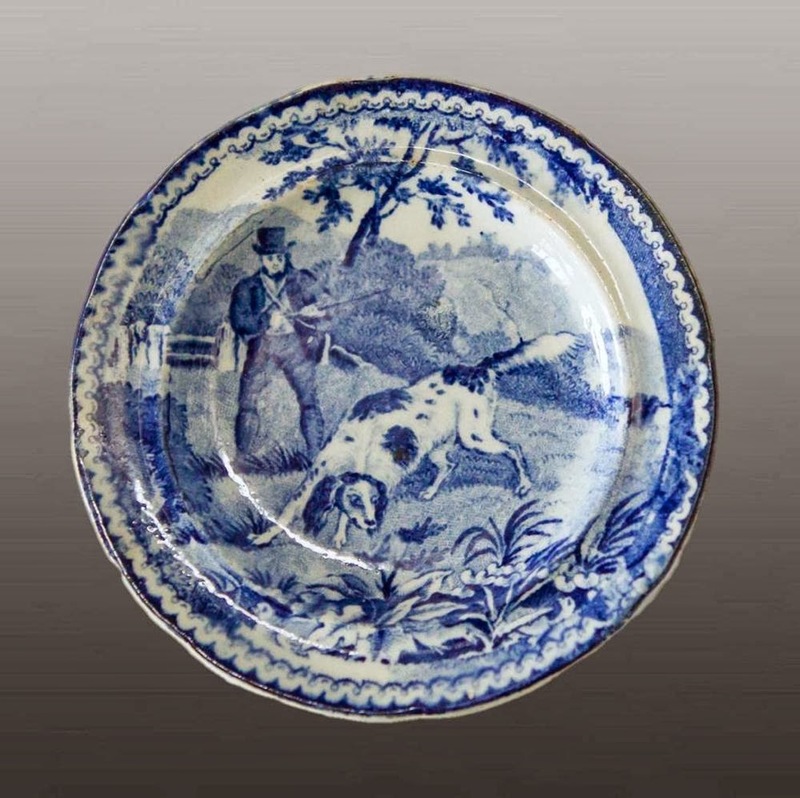 To run away with a man would have been enough to disgrace them. It is not known if their relationship was a sexual one. However, that was the gossip. At first the ladies were ostracized (I think they always were by their peers), but they appealed to the intelligentsia and the famous. 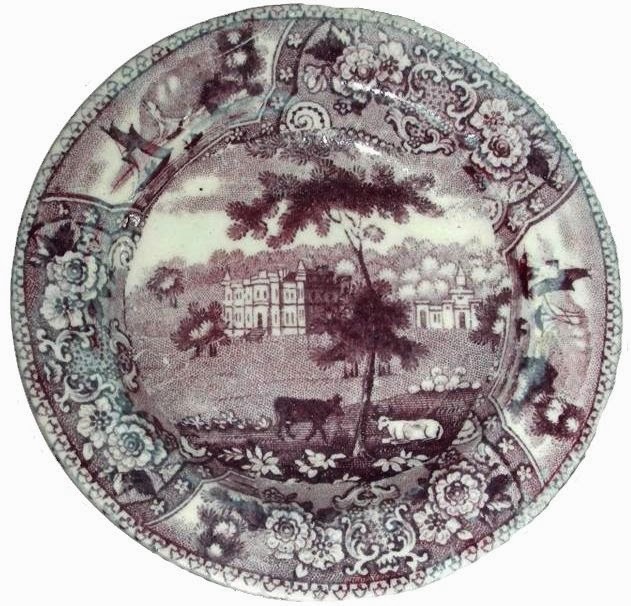 Robert Southey, William Wordsworth, Percy Shelley, Lord Byron, Sir Walter Scott, the Duke of Wellington, Caroline Lamb and Josiah Wedgwood were just a few who visited Plas Newydd, where an intellectual haven was created. Today, Plas Newydd and the ladies are a beacon for all of us who value freedom of the self as well as the intellect. We visited Llangollen a few years ago. I wanted to see the house where the ladies lived. 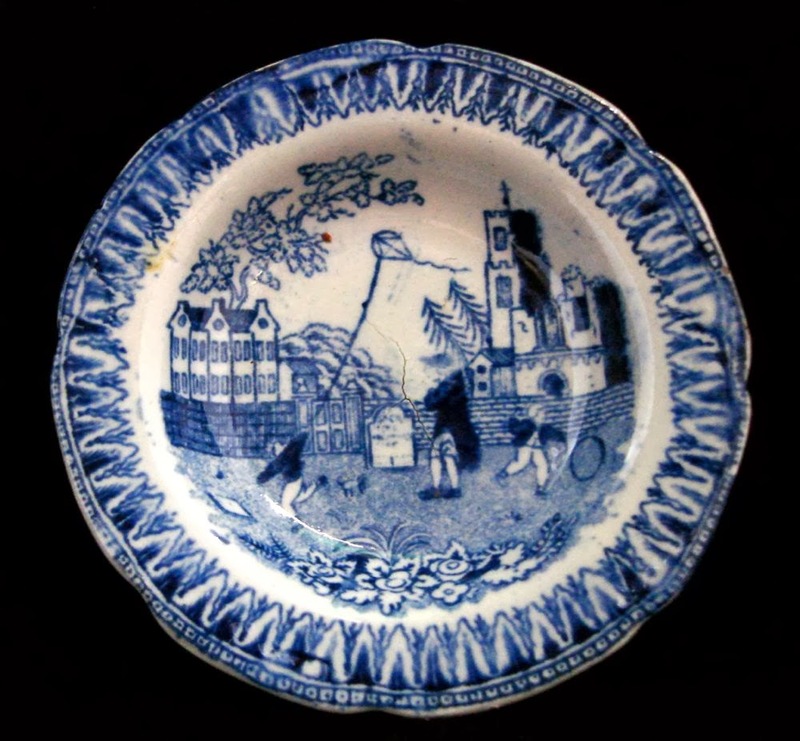 It looked nothing like the castellated and towered building on the plate, but it was not exactly a cottage. 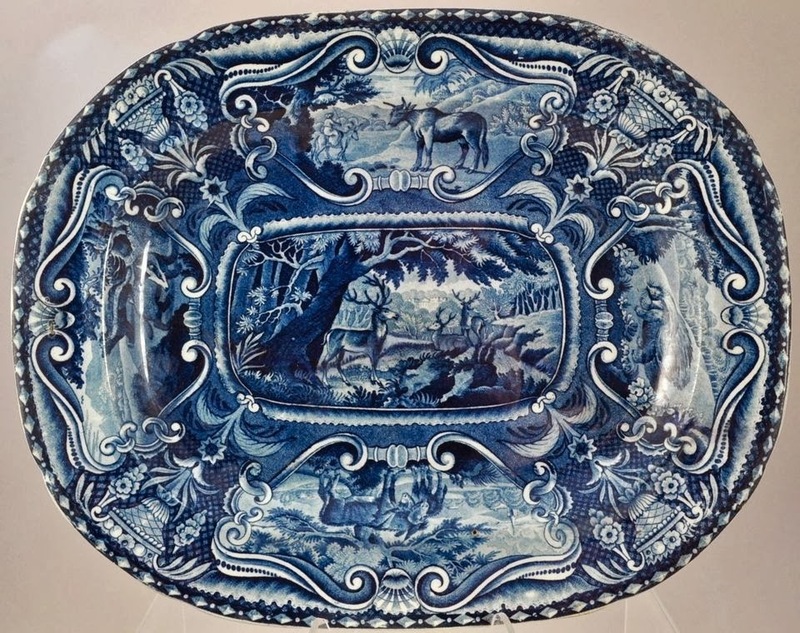 The ladies may have resembled the women on the horses when they were young, but not in the picture below. 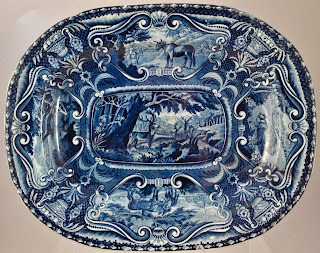 The inspiration for this post is the plate above and a wonderful post from a blog I follow, Nilly Hall. Take a look! 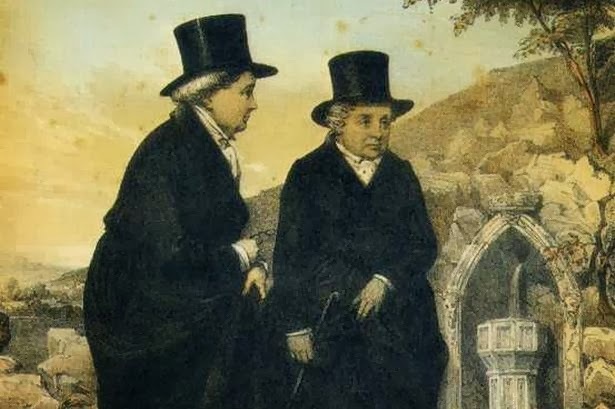 I also recommend a biography that I found in the gift shop of Plas Newydd titled The Ladies Of Llangollen by Elizabeth Mavor, Penguin Books 1971. 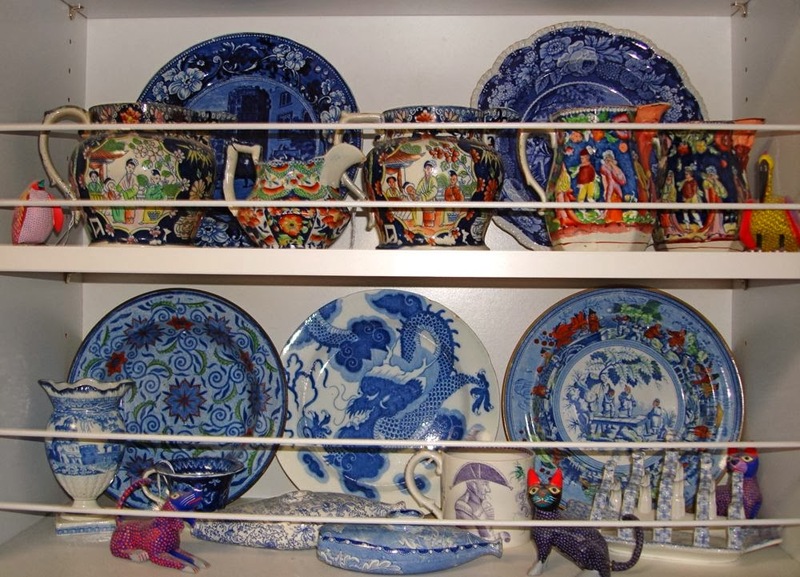 CUP PLATES OR TOY PLATES? 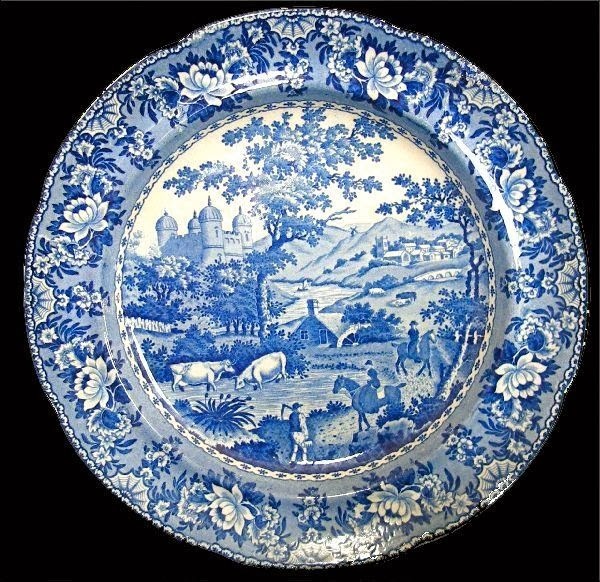 It is sometimes difficult to tell if a small plate is a child's toy plate or a cup plate. 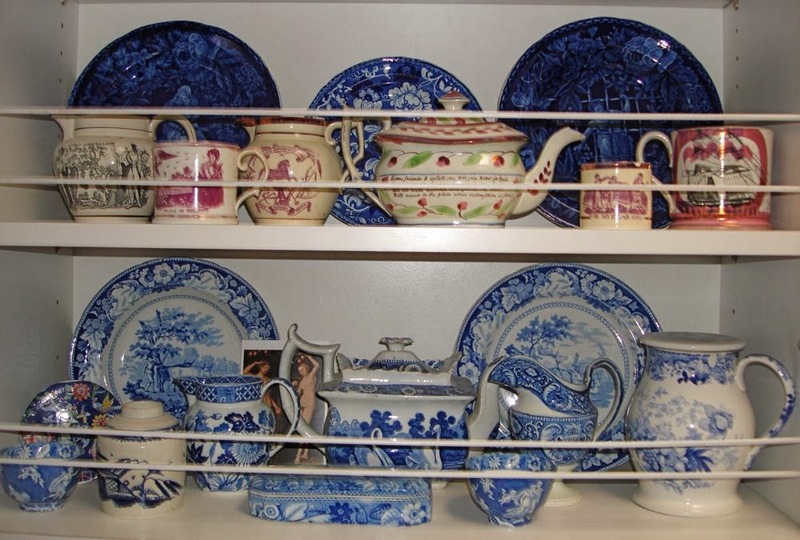 I read that a cup plate should be between 3 inches and 4.75 inches because it has to accommodate a cup. 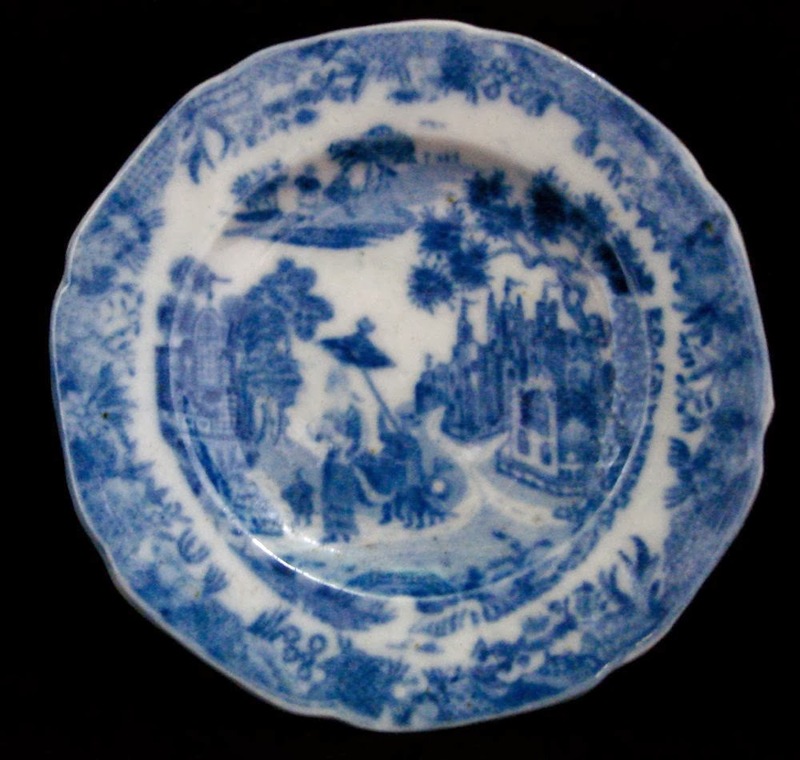 A toy plate can be much smaller, but is often as big as a cup plate. 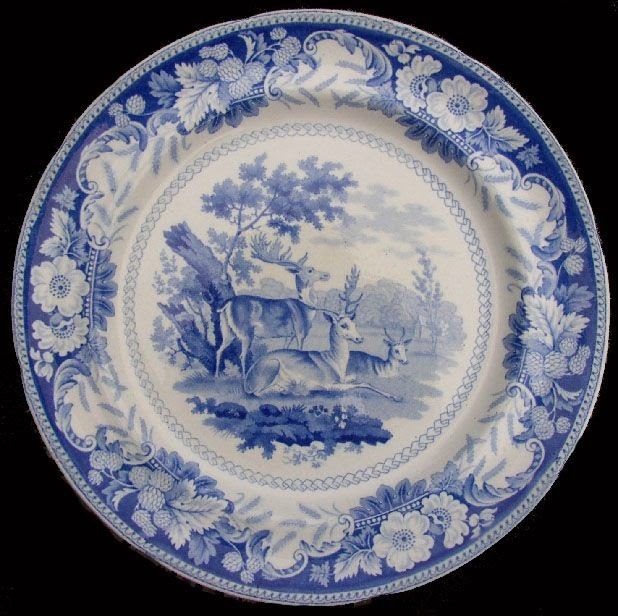 If a pattern matches an adult dinner or tea service, it is probably a cup plate. 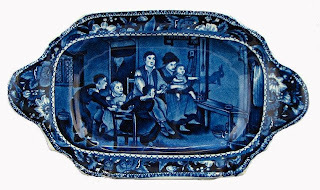 If it matches a child's toy tea service or toy dinner service, it is a child's item. 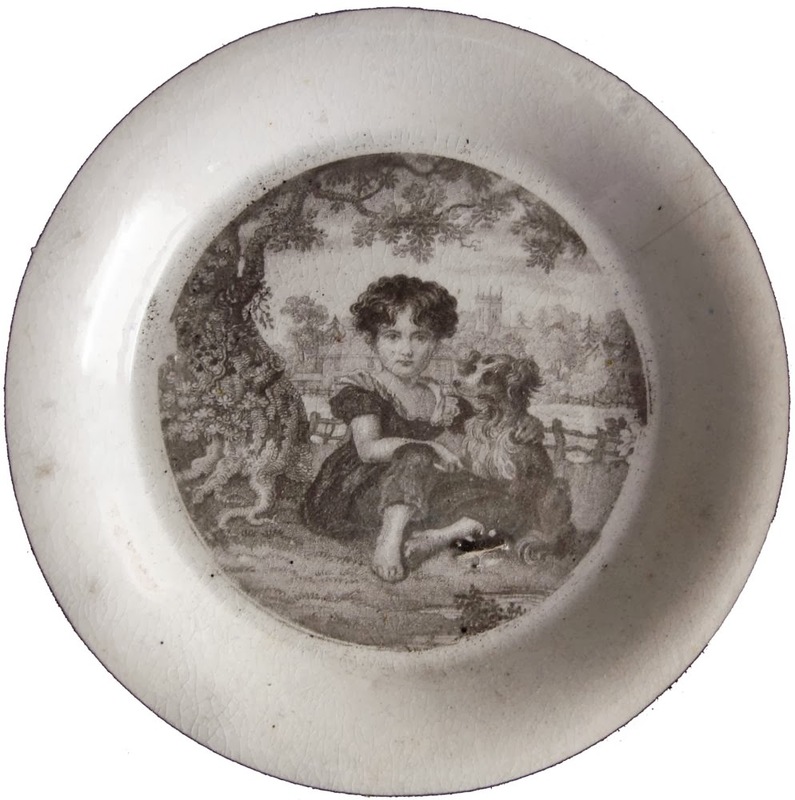 Sometimes a small plate is a gift or souvenir for a child (not part of a service). I wish it were always clear! 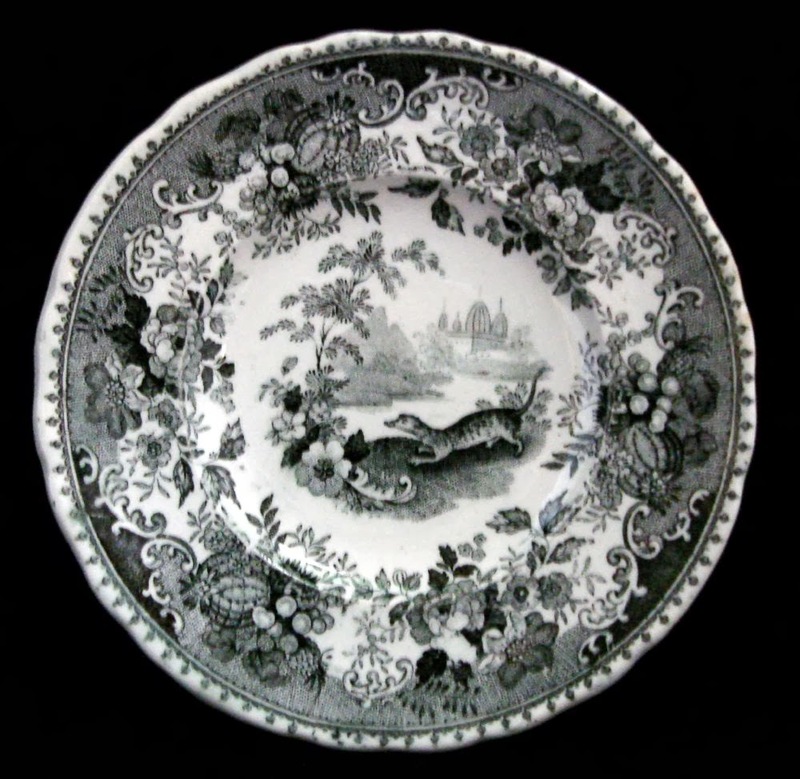 Until the research of Martin Pulver was published in the China and Glass Quarterly in October/November 1997, it was debated whether there really was such a thing as a cup plate (the small plates existed, but their use and name were a source of discussion between English and American collectors). However, Pulver shows a copy of an inventory list from an 1835 stock book that refers to Cup Plates! As to how they were used, that is still debated. 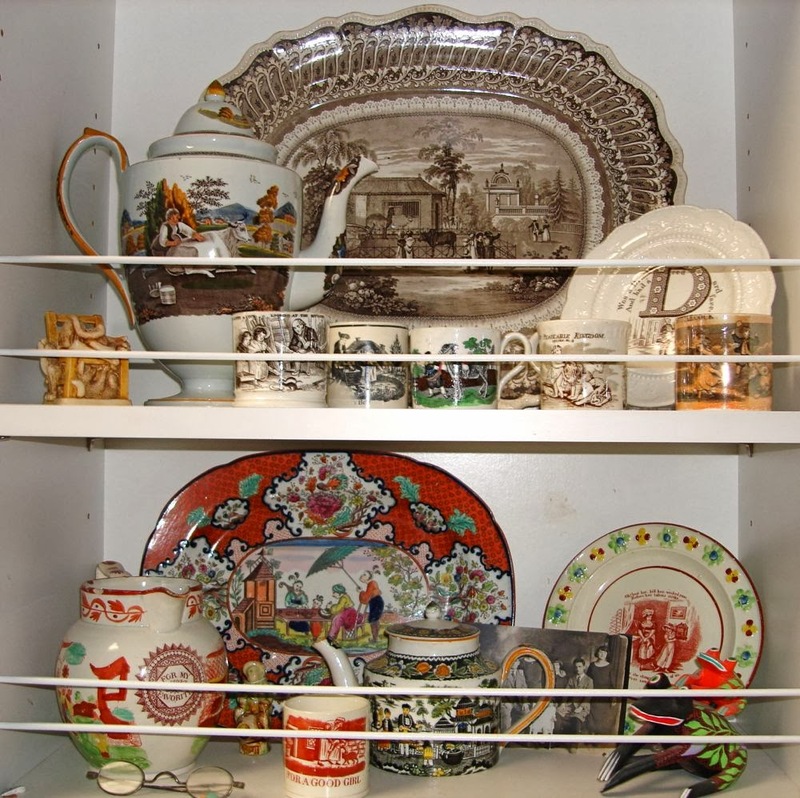 Richard H. and Virginia Wood in their book Historical China Cup Plates (no date given) say: "The little plates were a development of the early 19th century, when certain folk were accustomed to decant their tea into deep saucers of the day. 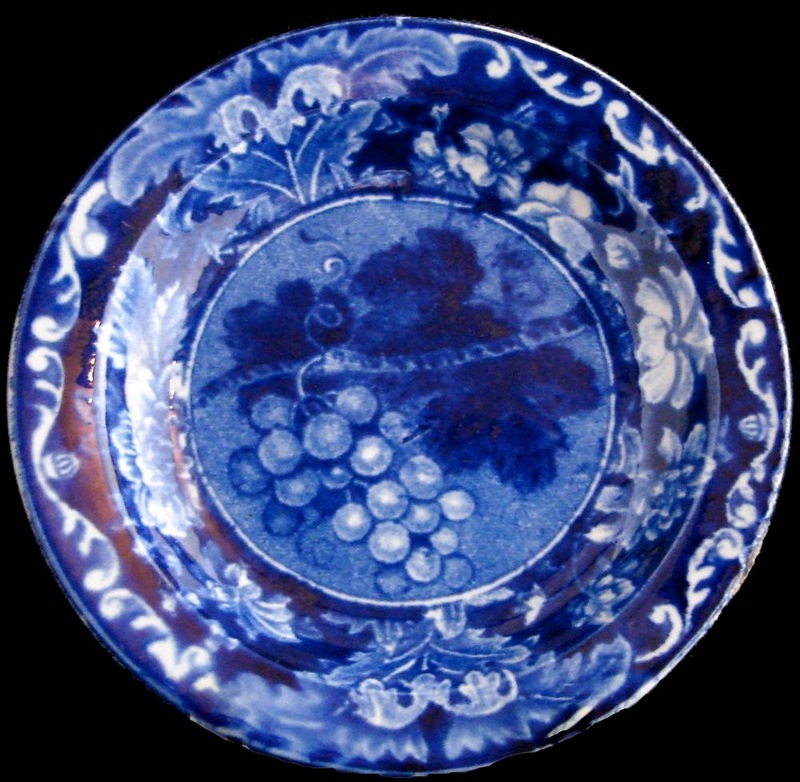 Then, to avoid soiling the linen or marring the table, the empty cups were placed on cup plates." 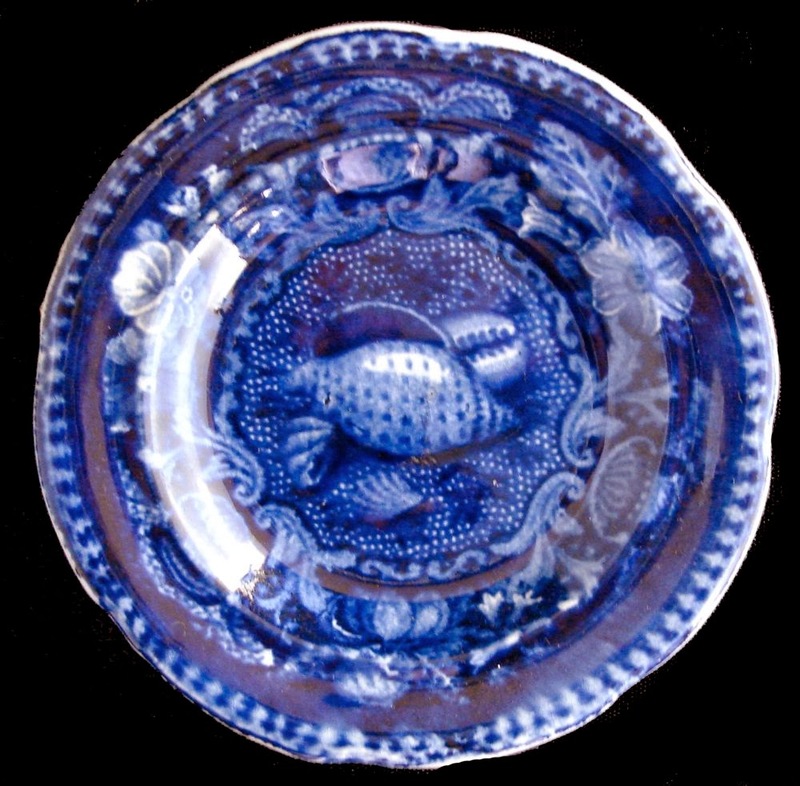 Dave and Linda Arman in Anglo - American Cup Plates - Parts I and II quote from the article by Martin Pulver (see the link above): "After much discussion, I feel that these plates may have originated in the early American method of taking tea, which followed closely the contemporary Continental European (not the British) of using the saucer to cover the cup while allowing the tea to steep. 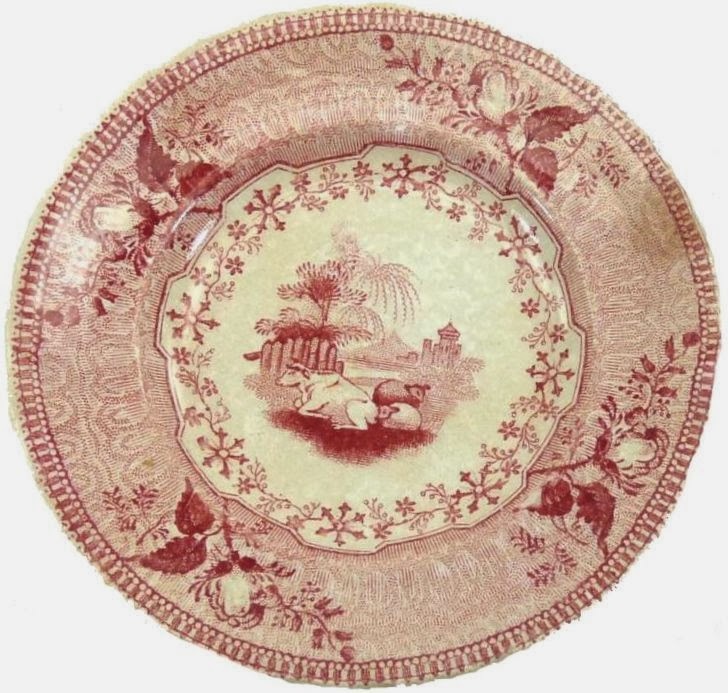 The wet saucer would then not be usable in polite society as a receptacle on which to put down the cup and so a small plate would have been necessary to take on that duty." 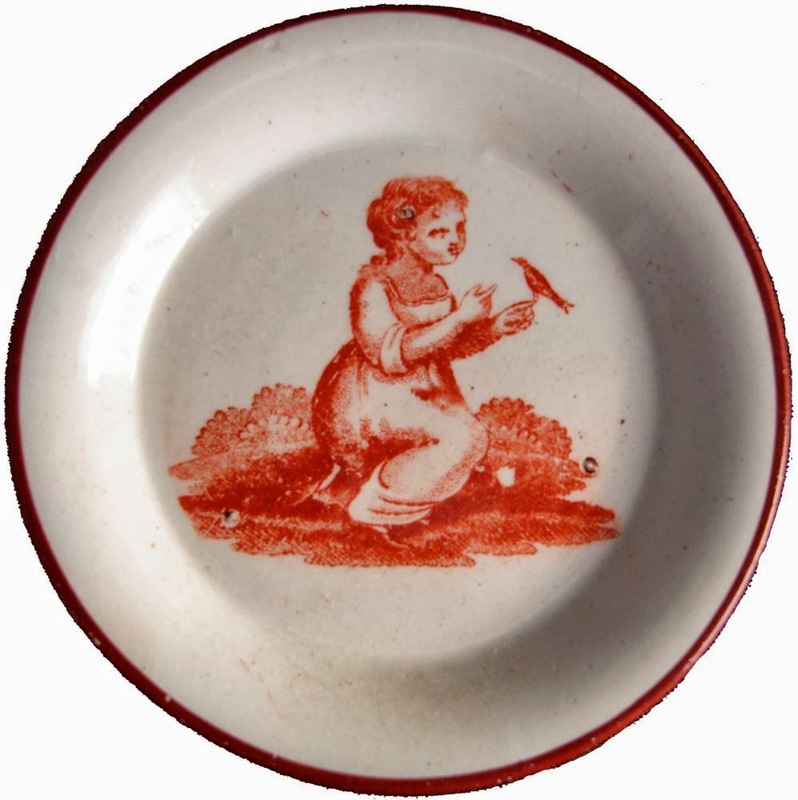 Below are a few plates that are part of a child's tea or dinner service and some that are stand-alone gifts. 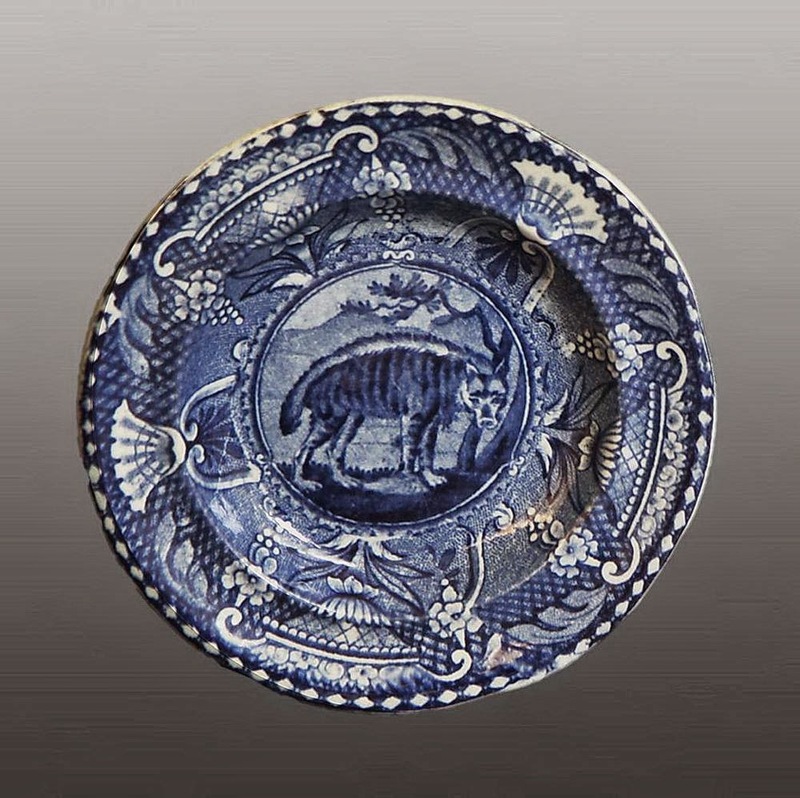 Cup Plates? Toy Plates? I'd love some feedback. These are just a few of the 116 posts I have published so far. They are some of my favorite posts, but I like some of the other posts even more. Let me know which are your favorites. 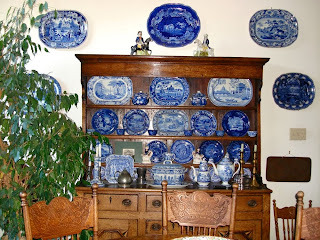 Below are some photos of my collection. You may remember that I live in Earthquake Country, so the dowels are a nod to security. 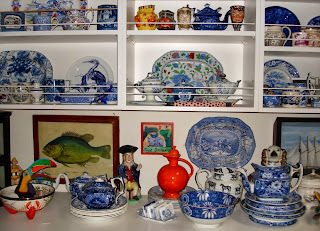 I mix transferware with other objects. The orange Fiesta carafe from the 40s or 50s belonged to my grandmother. The toucan is a Oaxacan wood carving. Notice the ship diorama in the right corner. Thank you all for reading my blog! 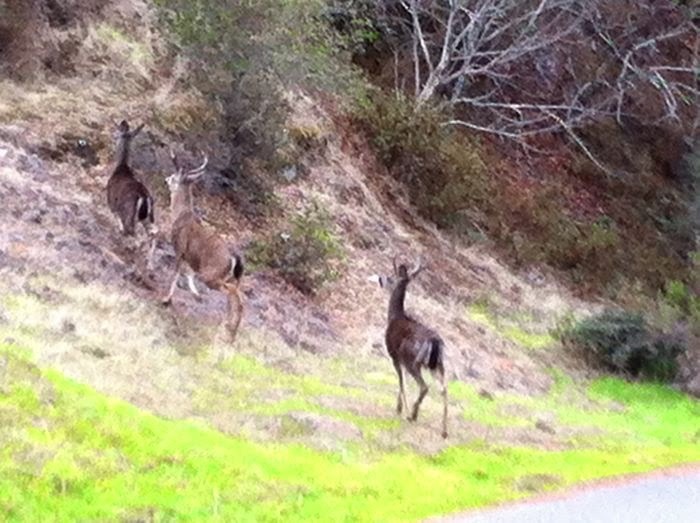 David and I were walking in the hills south of San Francisco on Saturday when we came upon quite a few grazing deer. I thought they were lovely. My sister calls them vermin with antlers, as they eat everything, even her roses! 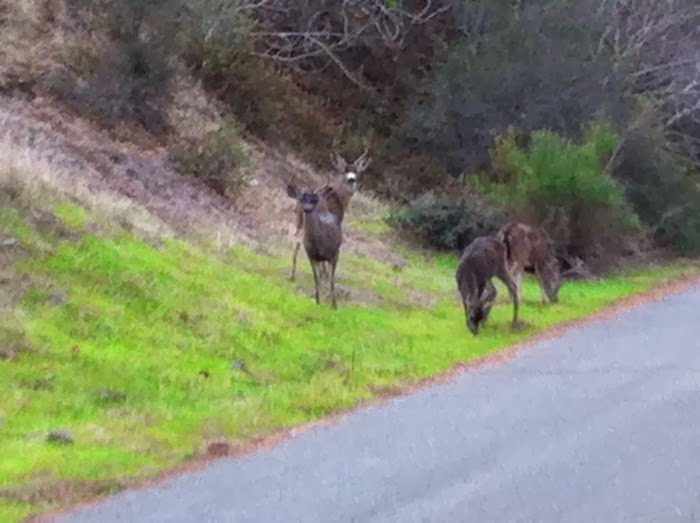 I think the deer may be California mule deer or black tail deer (it seems the difference has to do with the growth habit of the buck's antlers). I would have thought it had to do with the color of the tail! They left when we approached them! 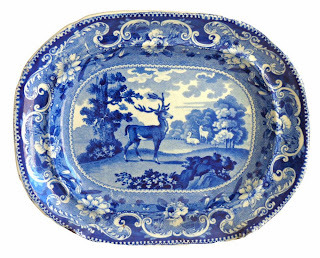 There are many deer patterns on transferware. 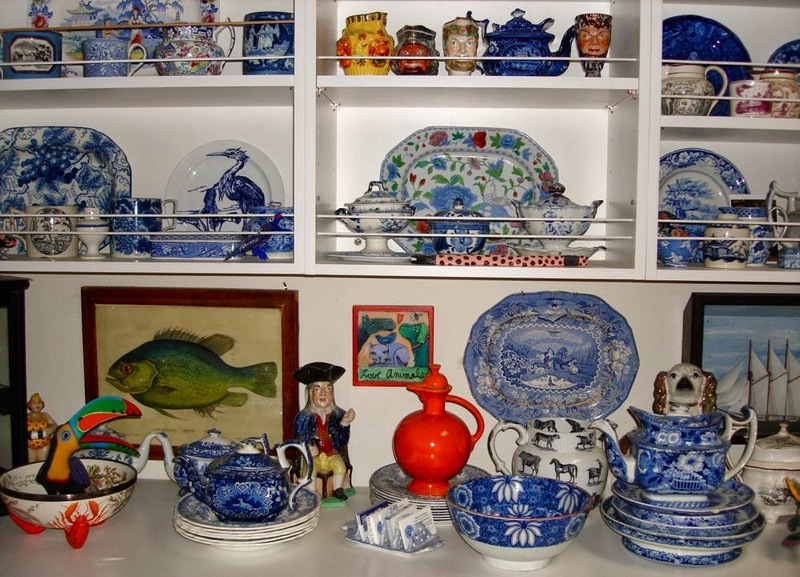 I shall show your just a few of my favorites. If you notice some resemblance between the patterns, it is because some are copied from the same source prints. See if you can spot them. 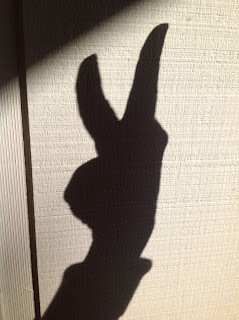 One of my favorite things to do when I was a child was to make shadow pictures on the wall. The only one I was any good at was a rabbit. I loved making the rabbit on the wall. Imagine my surprise when I found a Clews' pattern titled The Rabbit On The Wall! It literally felt like holding hands with the past. 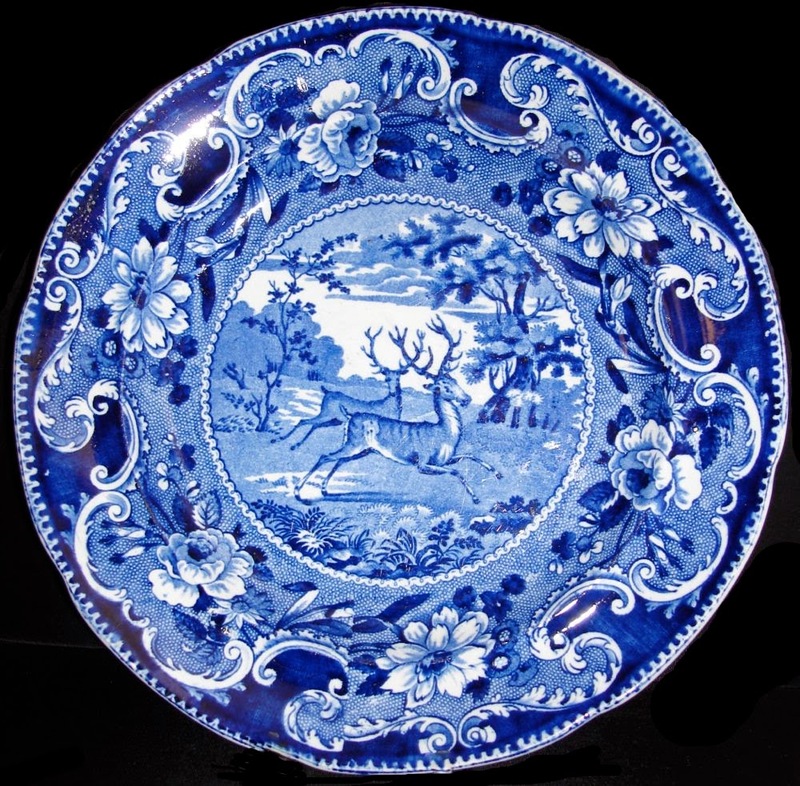 The pattern was copied from the work of Sir David Wilkie (1785-1841), hence the title in the cartouche, From Wilkie's Designs. 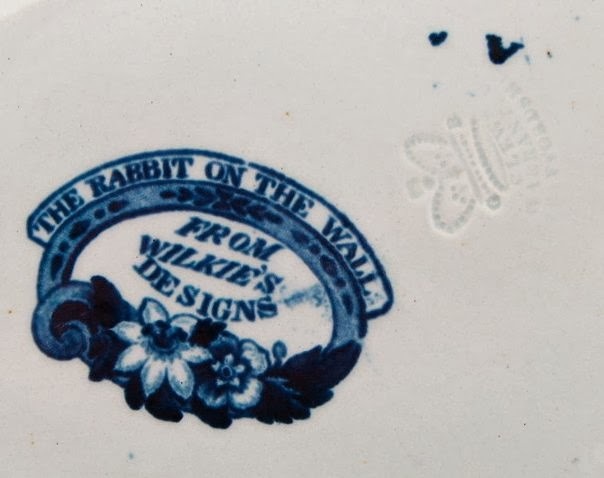 Clews used seven different patterns copied from Wilkie's paintings for both tea and dinner services: The Rabbit On The Wall, The Errand Boy, Christmas Eve, The Escape Of The Mouse, The Valentine, The Letter Of Introduction, and Playing At Draughts. 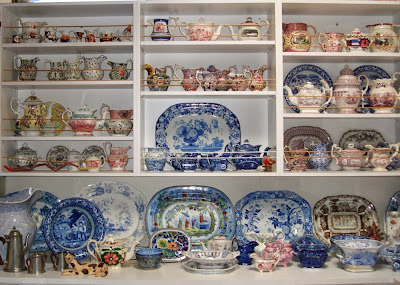 All of the patterns, except The Errand Boy, appear in the Pattern and Source Print Database of the Transferware Collectors Club. 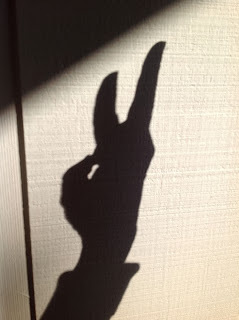 The father is making a two-handed rabbit, I only learned to use one hand. Make a fist and put up your index and middle finger. Voila! I used sunlight, but a lamp at night also works well. 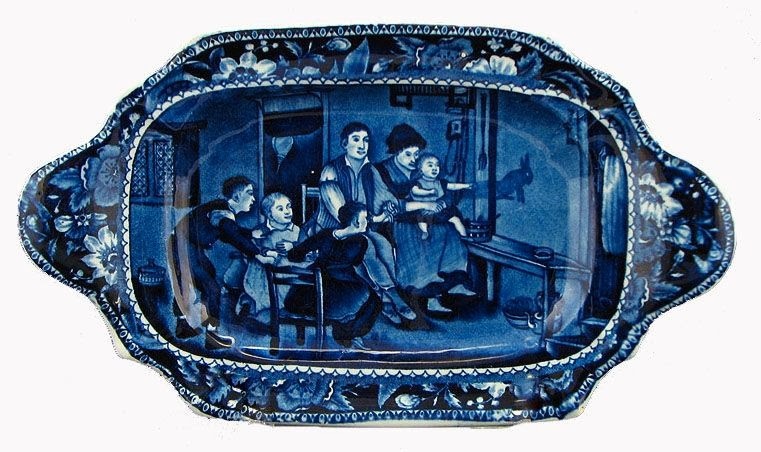 The boy in the Wilkie pattern is using a candle to throw shadows. 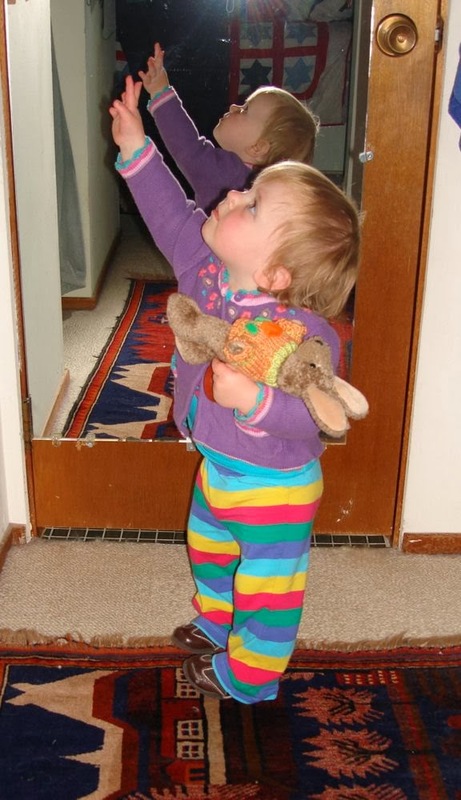 Maya tried to make a rabbit on the wall when she was 15 months old. 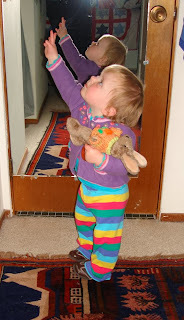 It was a bit out of her reach.